This one is a fairly strenuous double loop aimed mainly at doing two steep singletrack descents, with a bonus third singletrack descent added at the end. As far as Henry Coe rides starting from the Hunting Hollow parking lot go, this route comes with the minor advantage of not requiring a two-mile road ride segment before your tires can encounter a trail surface. The route begins virtually right from the parking lot. For those who equate Henry Coe rides with challenging climbs, this route will do little to change the park's image. While much of the ride's climbs actually take place on singletrack trails that are of much more recent construction than the park's fire roads, this is still a ride that will stick out in your mind for its tough climbs (if not for its crazy descents, but more on that in a minute). At least it does in mine. This is a route that was suggested to my by Paul Nam. Paul's name might be familiar to anyone who has put any work into the trail network at Coe or even to those who have researched Coe's trails online at any real depth. While I didn't realize this during my original chance meeting with him, he's one of the prominent figures of mountain biking trail advocacy and volunteer trail work around the South Bay. I'm not certain about his current affiliation, but I can see past mentions of his name in positions of presidency and board membership at organizations like ROMP (currently known as "Silicon Valley Mountain Bikers") and The Pine Ridge Association. Especially that last credential makes him one of the best "horse's mouths" from which to get the inside scoop on trails at Henry Coe in my estimation. The first thing on the ride is the route's biggest climb, which begins on Jim Donnelly Trail. The current Jim Donnelly Trail is a three-mile-long, modern singletrack that uses plenty of switchbacks as it roughly follows the path of a shorter and much straighter older fire road by the same name, which also used to be much steeper, naturally. Seeing such a long and nicely winding singletrack, my initial instinct would be to use it as a descent. However, Paul explains that they built this trail to be a humane way of climbing most of the way up to Willson Peak, so I complied with this vision of the trail on this ride and used it as a climb. However, the route you see on this page still allows you to repeat the lowest one mile or so of the trail in the downhill direction at the very end of the ride. Jim Donnelly Trail is a smooth singletrack that starts out under patchy tree cover but soon begins to follow the grassy and open spine of the ridge it climbs. The trail surface is completely non-technical. The width of the trail is almost never more than two feet and often closer to one foot. On the way up, you catch increasingly wider views of Hunting Hollow and Coyote Creek. Jim Donnelly Trail is a bit of a rarity in Henry Coe in terms of being one of the rare extended climbs I can remember in the park that could be considered reasonable. The thing to keep in mind, however, is that "humane" does not mean "easy" or "pleasant". This is still pretty serious work. As you can see by the ruler-straight portion of this climb on the elevation plot for the ride, about the first 2.2 miles of this climb sticks remarkably closely to an average grade of 9.5%. Of course, even in this very uniform part of the climb, there are numerous spots where the grade peaks around 13%. This combination doesn't make for a climb that I would call "cruel", but it's certainly not a climb that I would underestimate either. Out-of-shape riders will still hate this one. After a quarter-mile flat stretch that comes after that 2.2 mile climb, Jim Donnelly Trail resumes its constant grade through another set of switchbacks until it connects to Steer Ridge Road at the end of its 3-mile run. As soon as you're on this scenic fire road, any sense of moderation of the climb's slope is thrown out of the window, and Steer Ridge Road hits you with two separate stretches whose grades reach 25 to 27 percent within the remaining half mile of this climb, as well as staying above 15% grade in several more stretches in the same segment. On the positive side, views are open all around you in this part of the ride. You can spot Gilroy, Hollister, the peak of Mount Hamilton, and a number of other high peaks of the coastal range in the southeast. Steer Ridge Road then gently descends and gently climbs again along the top of the ridge over the mile or so that it covers next before it reaches Willson Peak. This is where you pick up Willson Peak Trail to do the ride's first singletrack descent. Just before that descent begins in earnest, you can take a short spur to the side in order to set foot on the actual Willson Peak as well, as you see on the route plot on this page. On a clear day, expect to be able to spot the snowy peaks of the Sierra Nevada range from here. Willson Peak Trail starts a steep descent almost immediately after that and doesn't really let you come up for air again until you reach its end. You lose nearly 800 feet of net elevation in just under one mile on this descent, as the trail adds almost no additional twists to its path that traces the natural shape of the landscape on its way down. That translates to an end-to-end average grade of -15.5%, which is already enough to qualify as "very steep" in my book. But, what makes this descent more intense is the fact that it's pretty uneven. The slope of the grade exceeds -30% several times on your way down, including in the trail's final tumble down to its junction with Grizzly Gulch Trail. While the trail surface has no rocky or rooty features that add any technical difficulty, the sheer steepness presents a challenge in its own right in some spots, especially with the inclusion of a narrow rut along the center of the trail at the time of my ride that constantly threatened to catch my front wheel as I descended, including at some of the steepest spots. When you find yourself at the bottom of the canyon on Grizzly Gulch Trail, you'll be heading uphill along the upper stretches of this trail. 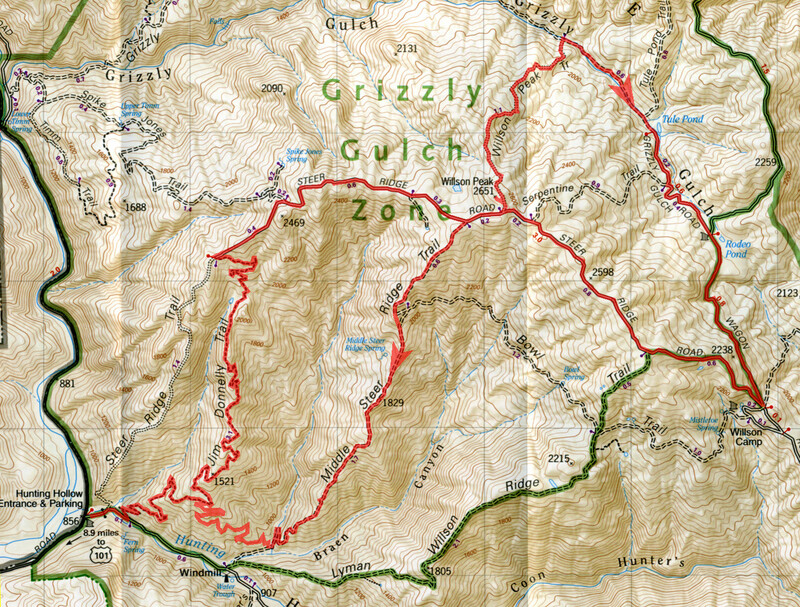 This will allow you to sample some of the singletrack portion of Grizzly Gulch Trail in addition to its fire-road portion at its highest elevations. Grizzly Gulch is a very fun trail and I would highly recommend its downhill traversal all the way to the Coyote Creek Gate on a different ride. On this ride, however, although you get to sample a short portion of its singletrack stretch, including a couple of fun creek crossings, you'll be doing a fire-road climb on this trail. The good news is that, with the exception of one short climb out of a creek crossing that's a hike-a-bike, this stretch of Grizzly Gulch Trail up to Rodeo Pond doesn't feel like a strenuous climb. In addition to changing its name first to "Grizzly Gulch Road" and then to "Wagon Road" along the way, somewhere around Rodeo Pond the trail completes its slow transformation into a fire road and becomes less interesting, as the canyon itself also begins to widen noticeably. This stretch feels more clearly like a sustained climb but, even here, the grade ranges typically between 5 and 10 percent. Taking Wagon Road all the way up to follow Steer Ridge Road uphill from its eastern end as this route does is the longer but easier way of getting back up to Willson Peak after the descent on Willson Peak Trail. If you are short on time and feel okay with a much steeper shortcut, you can take Serpentine Trail back to the top of the ridge instead, and save yourself 1.5 miles of distance and 250 feet of elevation gain. While Serpentine Trail isn't as crazily steep as consistently as Willson Peak Trail, it's still situated fairly similarly and has a few stretches of its own where the grade reaches 25%. So, you've been warned. One redeeming aspect of this ride is that not all of the elevation that you gained on the ride's initial climb is spent during the first descent. More than half of that climb is actually saved for the ride's longest descent on Middle Steer Ridge Trail. So, although part of the ride's second climb back up to Willson Peak also takes place on the steep Steer Ridge Road, the tough part of this second climb lasts for no more than half a mile before the fun resumes. This brings us to Middle Steer Ridge Trail. Paul mentioned that this trail is also known by the name "Severe". His advice to me for this descent was "make sure your wheels are on and your brakes are in good shape". That's good advice for this trail. Those who have spent any thought on trail design at all will know instantly that maintaining a judicious grade over a steep slope requires following plenty of switchbacks. So, seeing how Middle Steer Ridge Trail follows precisely the spine of the ridge on its way down with virtually no twists at all, it should be clear that it's doing exactly what the opposite of "maintaining a judicious grade" would be. Before the trail finally relents a little in the last quarter mile or so of its descent and begins to include a few switchbacks in its path, it descends for 1.5 miles pointing almost straight down at a ridiculous end-to-end average slope of nearly -17.5%! This is practically a plunge. The trail takes you through no real rock gardens or any steps-downs along the way, thank heavens. But the slope of this trail alone is enough for me to bump up the ride's technical difficulty rating by one or two points. In at least four separate stretches, the trail's grade reaches or exceeds -35%, and one of those four has been recorded as being steeper than -40% in my GPS data! These are slopes where you need to forget about even maintaining a constant speed as you descend; never mind being able to stop at all. You'll just have to allow yourself to rapidly accelerate down some of these "chutes" and hope to be able to bleed off your speed at an upcoming flatter stretch (which are almost always lined up for you, thankfully), all the while managing to keep the rubber side down. But be careful and don't make the mistake of out-riding your skill level while descending this serious trail. Right after you finish the actual descent on Middle Steer Ridge Trail and the adrenaline in your blood hasn't yet had a chance to subside, this particular route follows what's probably the most recently built trail in this part of the park to take you part of the way back up Jim Donnelly Trail again. If doing another significant (one-mile) climb at this stage of the ride sounds more like a final insult to you rather than a final treat, you can easily bypass this diversion and roll gently downhill to the parking lot from the end of Middle Steer Ridge Trail. That would save you 425 feet of elevation gain and a little over a mile of distance. This last climb on the Jim Donnely East Connector Trail (a.k.a. "E-Conn") looks and feels very similar to your earlier climb on Jim Donnelly Trail. The trail maintains a very steady grade of 9 to 9.5 percent by following plenty of twists and switchbacks. You then reap the reward for this final climb of the ride by descending the lowest one mile of Jim Donnelly Trail, as I've already mentioned above. This is a descent with an unbroken flow and even includes some rollers here and there that fast riders might be able to use to catch some air. If you do that, however, remember that the original purpose of the trail is climbing and watch out for other trail users who are bound to be approaching in the opposite direction. If you try this ride and you're left wanting more, one extension that comes to mind naturally is an additional side loop that Paul had originally suggested to me, but which I had to leave out of this ride due to time constraints. When you reach Rodeo Pond (at the junction of Grizzly Gulch Road and Wagon Road), instead of continuing straight as I did on this ride, you can turn left onto Wagon Road to follow it first to Wasno Road, and shortly after that down a singletrack descent on Tule Pond Trail, before continuing up on Wagon Road as this ride does. I haven't tried this side loop in person, but I expect the descent on Tule Pond Trail to be very similar to my experience on Willson Peak Trail. Expect this extension to add roughly 800 feet to your total elevation gain and three more miles to your ride length.